Bullying is never good. That should go without saying. Seeing a bully having to team up with a group of geeks so he can survive a battle royale with other members of the student body? That actually sounds like a lot of fun, and it's the concept behind Skottie Young and Aaron Conley's upcoming Image Comics series Bully Wars. Head back to school with Rufus, once the biggest bully around, as he's forced to eat some humble pie when he becomes the target of even bigger bullies. Young and Conley describe it as a comedy that's fit for all ages, so look for some big laughs and good life lessons for readers young and old. 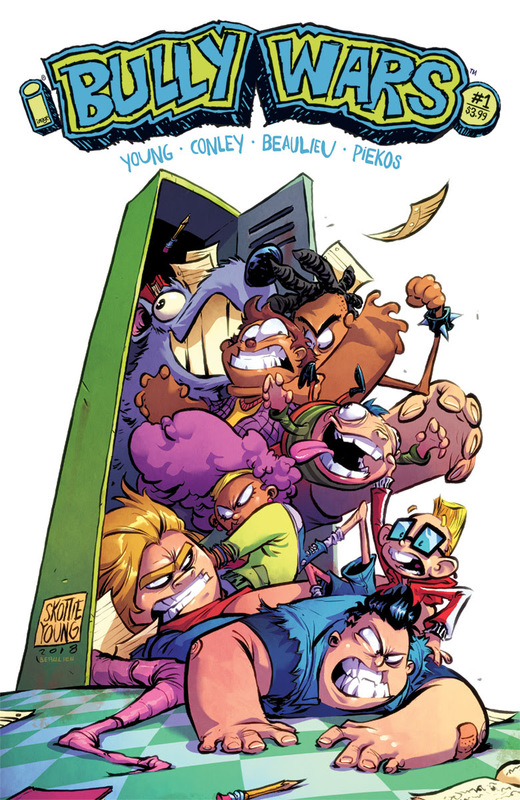 PORTLAND, OR, 06/12/2018 — I HATE FAIRYLAND and Deadpool writer Skottie Young teams up with artist Aaron Conley (Sabertooth Swordsman, Rocket Raccoon & Groot) for the hilarious, all-new ongoing series BULLY WARS. Bully Wars #1 will hit comic shops and digital retailers on September 5. Jun 12 Joe Casey and Ian MacEwan create a modern folk hero in Image Comics' "MCMLXXV"